Neva Sadikoglu-Novaky , the Secretary General of the European Conservatives and Reformists (ECR) Group in the Committee of the Regions (CoR), who illegally visited occupied Azerbaijani territories, sent an official letter to Azerbaijan's Embassy in Belgium asking not to be included to the list of foreign citizens who illegally visited the occupied territories, the Azerbaijani Foreign Ministry said May 14. In her letter, Sadikoglu-Novaky noted that as a representative of the organization she paid a visit to Armenia, where an ACRE event took place in December 2017. The letter states: “As part of the trip, a series of tourist activities were organized by the local partners of ACRE. On the day of the trip to the illegally occupied Azerbaijani territory of Nagorno-Karabakh, I was misled by the nature of the trip. What I believed was a cultural trip turned out to be a trip violating international law and regrettably led to me being unwillingly taken to the illegally occupied Azerbaijani territory of Nagorno-Karabakh." She said that she deeply regrets being misled by the local partners in Armenia and finding herself in a situation that jeopardizes her personal convictions on the illegal actions of Armenia. Sadikoglu-Novaky noted that as a Turkish citizen who travels to Azerbaijan on an annual basis for family reasons and indeed as an individual whose personal convictions are aligned with the position of Azerbaijan on the Nagorno-Karabakh conflict, she would not willingly jeopardize her right to enter Azerbaijan, according to the ministry. She kindly asked to accept this letter as a formal apology and expressed her hope that this would not affect her future visa requests to the Republic of Azerbaijan. 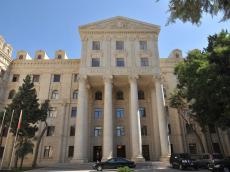 The Foreign Ministry said that Sadikoglu-Novaky's appeal was in a due manner considered and a decision was taken not to add her name into the list of foreign citizens who illegally visited the occupied territories of the Republic of Azerbaijan.